In the mindfulness of breathing we give the breath our full attention. We use the physical sensations of the breath as an object that we focus on. We just allow the breath to happen. This is not a breathing exercise. We simply observe, and see what happens. So, we start off by following the breath. After a while what tends to happen is that we forget all about the breath, forget all about meditation, and get distracted by some train of thought, which is often nothing at all to do with meditation. We don’t usually make any conscious decision to think about something outside of the meditation practice. It just happens as habitual patterns of behavior come into play. In fact, not only do we not choose to get distracted, we don’t have much choice at all! Our habits are controlling us. It’s more like our thoughts are thinking us than we are thinking them. So one of the first things we learn in meditation is just how little control we do have — it’s quite a disconcerting realization for many of us. However, the fact that we often aren’t in control isn’t cause to become despondent — it’s the same for most of us most of the time. And we have to become aware of how distracted we are before we can do anything about it. Question: So what do we do when we’re meant to be meditating, but aren’t? Often we’re getting irritated, or fantasizing about things we’d rather be doing, or undermining ourselves, or dozing, or worrying about something. Most of these activities aren’t very helpful or fulfilling. They’re not things we decided to do, they’re simply the habitual things we do when we’re not aware. The things we do when we’re meant to be meditating but aren’t, are called the hindrances to meditation, and we’ll be exploring them in more detail in later classes. As well as learning about them we’ll learn a whole bunch of tools to help us deal with them. The difference between being mindful and not being mindful is a big one, although we’re often not very good at recognizing the difference between the two states. After all, we slip in and out of awareness all day. But there really is a big difference between being mindful and not being mindful, as we’ll learn to see. So we get distracted, but at some point we become aware that we haven’t been aware. In other words we regain our awareness. This is a crucial point in the meditation process. Now we’re aware again. Now we’re no longer being driven by our habits. We have freedom again. We can decide that we don’t want to re-enter the world of distractedness. We have choice. We can choose to exercise being aware rather than be dominated by our habitual distracted states of mind. We have an opportunity to cultivate awareness by maintaining our mindfulness of the breath. 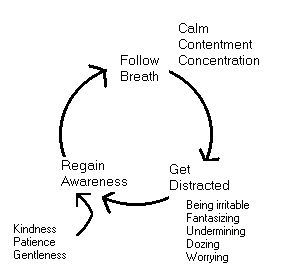 When we realize we’ve been distracted we can take our awareness back to the breath. Thanks for pointing that out, Glenn! It’s fixed now. before asking, let me tell you höw much I appreciate your wonderful site, which is both the most thorough and down-to-earth on this topic I know of. My question: On a site about vipassana meditation I came across a recommendation – or, rather, a rule – that in order to gain any results, the “absolute minimum” of time spent sitting each day should be 2 hours . Now I feel rather uneasy about such claims and don’t find them very helpful because to determine if your meditation is “good”/worthwhile or not so good should be based rather on its quality than the time spent on the floor. – What do you make of statements like these? Is there a minimum of time for daily practice that you would recommend? I think most people can manage at least 20 to 40 minutes a day. Now, another question: I’ve recently come to concentrate not only on my breathing, but also on my heartbeat, mostly in the spaces or pauses between the in- and out-breath. Since I’ve always felt my heartbeat fairly strongly and it is always “there”, it seems like a good anchor for concentration, too. Do you happen to know of any tradition that uses heartbeat as a focus? I don’t. Obviously, people notice their heartbeat while meditating, but I don’t know of any traditions that use it as a focus.